Nicolas Lopez Garcia, 44, was arrested on suspicion of attempted murder, assault with a deadly weapon and resisting arrest on Monday, May 11, 2015. MENIFEE, Calif. -- A man allegedly walked across the 215 Freeway in Menifee and stabbed an 18-month-old baby while his mother and several other family members attempted to change a tire on their disabled vehicle early Monday, California Highway Patrol officials said. The family-of-five pulled over on the right shoulder of the northbound 215 Freeway, just south of Newport Road, at about 1:20 a.m. Monday to change a tire on their 1990 Mazda hatchback. That's when 44-year-old Nicolas Lopez Garcia, who was walking along the opposite side of the freeway, crossed all lanes of traffic toward the victims. 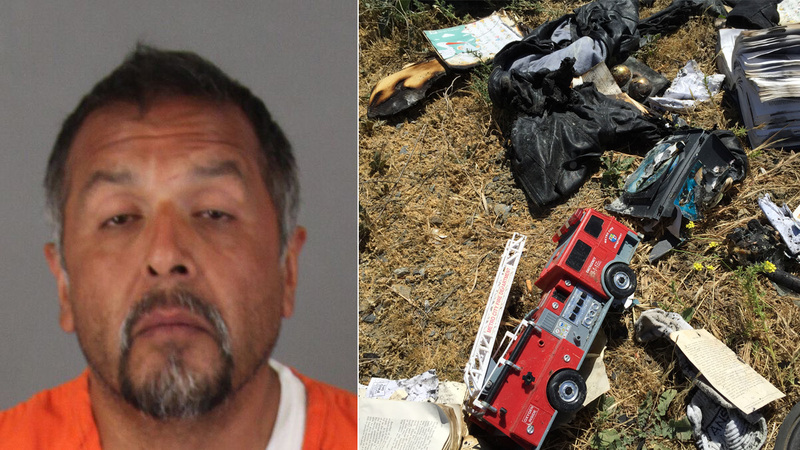 Armed with a broken plastic freeway paddle marker, Garcia allegedly smashed the driver's side window, broke out the rear window and began stabbing the baby with the broken, jagged edge of the paddle, CHP said. Three adults exited the Mazda and attempted to grab the paddle from the man. They sustained minor to moderate lacerations during the struggle. After re-entering the vehicle, the victims fled the scene and called 911. The mother and the baby were transported to Inland Valley Medical Center with non-life threatening injuries. Responding CHP officers found Garcia kneeling on the shoulder of the freeway. He was allegedly setting fire to some of the victims' personal belongings. CHP officers extinguished the fire and ordered Garcia to follow officer's commands. A Taser was used after he refused to cooperate with CHP officers. The motive for the attack remains under investigation. Garcia was booked into the Southwest Detention Center in French Valley on suspicion of attempted murder, assault with a deadly weapon and resisting arrest. He is being held in lieu of $1 million bail.